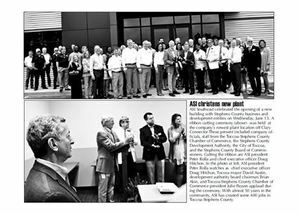 "ASI Southeast celebrated the opening of a new building with Stephens County business and development entities on Wednesday, June 13. A ribbon cutting ceremony was held at the company's newest plant location off Clary Connector. Those present included company officials, staff from the Toccoa-Stephen County Chamber of Commerce, the Stephens County Development Authority, the City of Toccoa, and the Stephens County Board of Commissioners. Cutting the ribbon are ASI president Peter Rolla watches as chief executive officer Dough Hitchon. In the photo at left, ASI president Peter Rolla watches as chief executive officer Dough Hitchon, Toccoa Mayor David Austin, Development Authority board Chairman Brian Akin, and Toccoa-Stephens County Chamber of Commerce president Julie Paysen applaud during the ceremony. With almost 50 years in the community, ASI has created more than 400 jobs in Toccoa-Stephens County."